WASHINGTON, DC—As the federal government undertakes a major initiative to issue new identification cards to the nation’s 58 million Medicare beneficiaries, an AARP survey finds that a majority of those enrollees are at risk of being victimized by fraud schemes designed to capitalize on the card replacement program. 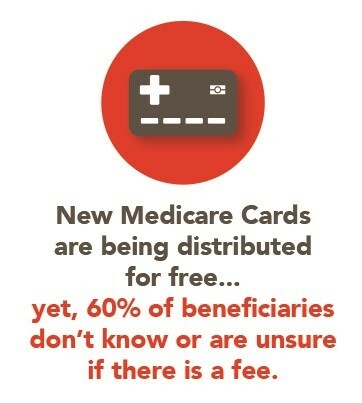 In response, AARP has launched an education campaign to raise awareness among consumers about Medicare Card scams. The AARP education campaign includes social media text and video postings, website content, and a cover package in the April edition of the AARP Bulletin. Local AARP state offices are also distributing a handout that details the new card rollout and associated scams. AARP is also teaming up with the Federal Trade Commission to present a free webinar on Thursday, April 19, about Medicare cards and fraud schemes. Register for the webinar at: www.aarp.org/FraudWebinar. The AARP Fraud Watch Network launched in 2013 as a free resource for people of all ages. Consumers may sign up for “Watchdog Alert” emails that deliver breaking scam information, or call a free helpline at 877-908-3360 to speak with volunteers trained in fraud counseling. The FWN website provides information about fraud and scams, prevention tips from experts, an interactive scam-tracking map, fun educational quizzes, and video presentations featuring Fraud Watch Network Ambassador Frank Abagnale. Abagnale, the renowned fraud expert whose personal story was depicted in the hit movie “Catch Me If You Can,” is also host of a new AARP weekly podcast series, “The Perfect Scam,” that launched last week. In March 2018, AARP engaged Alan Newman Research to conduct a national research study among U.S. adults ages 65 and older about their experience and knowledge around the new Medicare cards and potential vulnerability to scams related to the new card and benefits. A total of 800 telephone interviews (560 via landline telephones and 240 via cell phone) were completed between March 12 and March 19, 2018. Survey length averaged 10 minutes. The total sample of 800 respondents yields a maximum sampling error of ±3.5% at the 95% level of confidence. See the research report for additional information.